We have posted the following documentary videos to stimulate the Christian viewers’ minds into thinking and/or re-thinking their traditional Christian beliefs, particularly those that are based on church dogma and doctrine. By no means am I endorsing the videos’ messages as true or valid. In fact, there are expressed opinions and views by some of the featured resource persons, which I might find questionable or arguably disagreeable or just plain wrong. Nevertheless, take them for what they are basically—seemingly controversial alternative gospel accounts and teachings laden with a unique spiritual richness of their own. Here are some gnostic sayings of Jesus to ponder and contemplate during your quiet time (reproduced from posts originally published in our Facebook page). They are quotations from The Gospel of Thomas. Jesus said, “If your leaders say to you, ‘Look, the (Father’s) kingdom is in the sky,’ then the birds of the sky will precede you. If they say to you, ‘It is in the sea,’ then the fish will precede you. Rather, the kingdom is within you and it is outside you. Jesus addresses Truth seekers, encouraging them to continue working for the illumination of their souls until they realize it. Upon realizing the Truth, the seeker will initially be unsettled or disoriented because spiritual truth is unlike anything a human person is normally accustomed to knowing in the outer world as perceived by the bodily senses. However, this initial “disturbance” to the human state of consciousness will give way to the transformative enlightenment of the individual, which feels like a marvelous experience of oneness, unity, increasing innate affinity, or a “divinization” (per Teilhard de Chardin) of the universe. Once the spiritual or divine state of consciousness takes root in the mind of the individual, the illumined soul assumes its “divine sonship” as the incarnate Son of God by which spiritual dominion over the world is manifested and exercised. At this final stage, the illumined soul stays in a state of spiritual rest (the Sabbath) where the seeker is now functioning as a mere beholder of God in the world. There is no becoming or doing of humanhood anymore. There is only a continuing beingness immersed in spiritual peace and divine oneness. Seek spiritual truth within you, but, at the same time, live your outer life in the world by the truth that is unfolding from within you. Jesus informs us that the search is essentially an inward search in consciousness, yet we are to remain open and receptive even in the outer world to seeing the presence of God everywhere. In the end, we shall realize that the inner world and the outer world are really one in God. Here Jesus is describing the nature of the God-Self and the effect of opening one’s awareness to the Christ-Truth. When Christhood is realized, the individual undergoes a transformation by which the divine personality of the Godhead, the Christ, begins to express Itself in the individual as his/her mind is illumined with spiritual truth. Consciousness or Spirit (God) is all that there is, none else apart from it nor anything separate from it. It can be realized as the essence of all form. The individual who takes in or imbibes this awareness of nondual oneness in consciousness, will come to the realization of its truth in himself/herself as his/her true Selfhood and Being. The realization will come about as the result of inner contemplation and silent meditation, not by external activity or by looking for it outside of oneself. Jesus said, “A person cannot mount two horses or bend two bows. “Nobody drinks aged wine and immediately wants to drink young wine. Young wine is not poured into old wineskins, or they might break, and aged wine is not poured into a new wineskin, or it might spoil. There is an essential, fundamental inconsistency and incompatibility between the human state of consciousness (error, material sense, carnality, mammon, the flesh, this world, sinfulness, etc.) 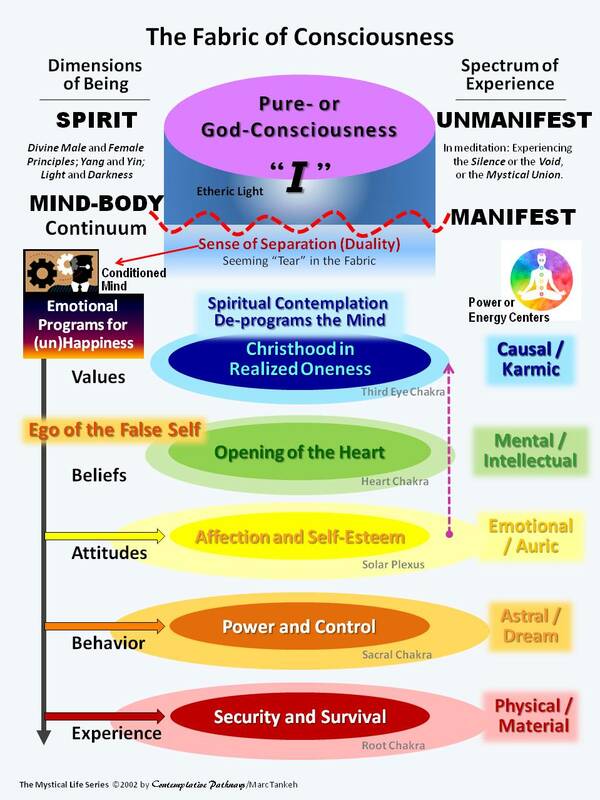 and the spiritual/divine state of consciousness (truth, the Spirit, God, “My kingdom,” grace, etc.). In the human condition, this duality is experienced as constant friction and apparent conflict between these states of consciousness as they seem to wrestle for dominion in the mind and in life. Eventually the individual tips the balance in favor of the paradigm shift in transformational awareness by finally awakening to the mystical truth of oneness. Once this spiritual enlightenment of the mind begins to occur, the old human nature dissolves as (1) the mind becomes UNconditioned (not re-conditioned) and (2) the false self system of the human ego is dismantled. Thus, the individual is reborn to the Spirit and ultimately Christhood is attained. Video | This entry was posted in Consciousness & Spirituality, Contemplation/Meditation, Mind, Mysticism, Oneness, The Mystical Life, Transformation and tagged alternate gospels, Apostles, Christianity, crucifixion, gnosis, gnostic gospel, Gnosticism, gospel, Gospel of Thomas, Marvin Meyer, Mary Magdalene, Nag Hammadi, Peter, resurrection, sayings of Jesus, Shroud of Turin, Stephen Patterson, Thomas. Bookmark the permalink. Yes, I agree totally. The question is: How can one gently and easily connect to this state of consciousness — at will?